My dog has a nasty habit of eating everything that crosses his path. Whether its chewing gum, little rocks, debris grass or mushrooms he tries to eat it. It’s worrisome because I know that some of the items he digests aren’t good for his system but it’s also difficult to prevent him from eating them. The one substance that makes me very nervous is mushrooms. They seem to grow everywhere in yards, woods, on the side of the road and most are very hard to identify. Some species of poisonous and nonpoisonous grow right next to each other. There are so many different types of fungi looming in the grass you can almost never tell which can are fatal. Hopefully I can help give you a little help on what to look for on the ground or on your pets. First off, Mushrooms are a type of fungus that can be found growing in damp, dark places like soil and inside trees. 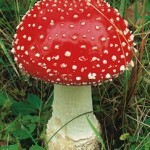 While most mushrooms are edible there are some that are poisonous and very dangerous. 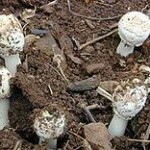 The mushrooms in these groups can be virtually fatal. The amanitas fungi grow as an egg shaped ball it breaks open as it continues to grow. Full grown amanitas are umbrella shaped caps that are brown, yellow, white or red. 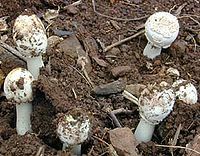 They also have a cup around the base of the stem and are found buried right under the surface and may not be visible to the wandering eye. They have white gills and a ring around the stem. This type of fungi is found during the summer and fall. False morels are tricky fungi because some people have reported really enjoying eating it while others have experienced serious illness and possibly death. False morels have wrinkled caps and are black, white, brown or red in color. These mushrooms can grow 2-8” high. The bottom of a false morel hangs down like a dress. The little brown mushrooms are small to medium sides, brown mushrooms with many colors in their spores. Some LBMs are not dangerous and are used as hallucinogenic but some are very deadly. Due to their difficulty in being identified LBMs should be avoided at all costs. They are found during the spring, summer and fall and are located in many regions. Many times pet owners don’t realize that they have very poisonous mushrooms growing in their own back yard. Mushrooms vary in size and can have very good hiding places. If you have pets this is important information to think about. It’s a good idea to inspect your yard every morning and especially if your region is experiencing damp weather. New mushrooms can sprout up overnight. When you do find mushrooms in your yard, be sure to dig them up and kick up the spores to make sure they won’t grow back. 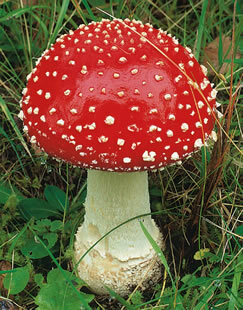 If an animal eats a mushroom the symptoms of poisoning usually begin within 30 minutes to 6 hours of ingestion. They range from vomiting, diarrhea, profusely salivating and complicated digestive problems. If your dog is only experiencing stomach irritation this should last about 24 hrs and require limited veterinarian assistance. If your pet is experiencing a slow heart beat, is profusely salivating or has increased tear production these symptoms almost always require immediate veterinary help. These symptoms usually take more time to appear once the fungi have been eaten. Some people reported that their dog appeared drunk. This is called ataxia and occurs because the poison affects the neurological system causing stumbling, seizures and kidney failure. A hallucinogenic syndrome will occur within your pet and appear as restlessness. Your pet may hallucinate and snap at invisible bugs, stagger or have muscle tremors. Usually animals that ingest hallucinogenic mushrooms should be closely monitored by a veterinarian. If you have a pet that likes to eat grass the chance of them eating a wild mushroom is very likely. Some animals become sick simply from licking a poisonous mushroom or are allergic even to edible mushrooms. If you happen to catch your pet ingesting a mushroom then you should remove any leftover remnants of the mushroom from the dog’s mouth and induce vomiting. To induce vomiting you will need either 1 tsp of syrup of ipecac or 1 tablespoon of hydrogen peroxide 3%. Repeat the hydrogen peroxide repeat 3 times every 10 minutes. Then call your veterinarian immediately and inform them of the ingestion. If your pet has eaten poisonous mushrooms but you didn’t catch him in the act and is experiencing poisoned symptoms then call your veterinarian for immediate emergency assistance. michael kors handbag This series of products has become a hot topic of international fashion district when he was promoted.